Workers picketing a Chicago Hyatt hotel yesterday got an unpleasant surprise: Heat lamps. It was already approaching 100° at 8 a.m. when I arrived at the Park Hyatt where, after 22 months of stalled negotiations, hotel workers were staging a one-day picket to protest the hotel chain’s intolerable treatment of their housekeeping staff. 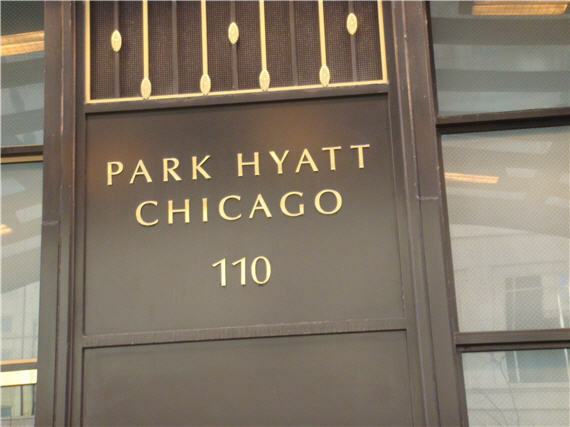 In case you didn’t know, Hyatt is owned by the Pritzker family. Heiress Penny Sue Pritzker chairs Obama’s national campaign finance committee. She is also big player in Democratic Party politics as well as in the world of anti-union, corporate school reform and was recently appointed by Mayor Rahm Emanuel to a seat on the Chicago school board. Pritzker’s response to the Park Hyatt strikers was to turn on the hotel’s powerful heating lamps to try and bake the workers into submission on this brutally hot day. But this seemingly inhuman and probably illegal response seemed to have had just the opposite effect. Picketers began chanting, “Hyatt can’t take the heat, but we can!” The lamps were left on until word got out and media began to show up. Union workers say someone turned on the heat lamps in blazing hot broad daylight Thursday, as they walked a picket line in front of the Park Hyatt Hotel. Look at the endpoints. See a problem waiting to happen? While it’s amusing and somewhat comforting to be reminded that irrationality runs rampant on the other side of the aisle, too, it’s more than a little bit of a stretch to tie this incident to Pritzker, much less Obama. It’s more likely a decision made by the local hotel manager–or even an irritated desk clerk tired on hearing the protests. If these strikers are anything like those who operate in downtown DC, they get annoying quick. At least the Hyatt strikers were apparently actual Hyatt workers; in DC, they’re temps hired at minimum wage and no benefits. But the modus operandi in DC is to block the sidewalks, use bullhorns and drums, and otherwise create a horrible racket that reverberates for blocks, disturbing those who have nothing whatsoever to do with the grievance in question. Turning on the heat lamps to make one’s entranceway less hospitable to that sort of thing is just fighting fire with fire. In this case at least, the workers have a legitimate beef with Hyatt, which apparently has spent the last couple of years shedding its full-time housekeeping staff and replacing them with outsourced contractors. It’s likely a more efficient way to run a business but a lousy way to treat long-time workers. Not to mention create a race to the bottom in the economy. I’m not well versed enough in Labor law to say for sure, but turning on the heat lamps in the area where the picket line was might be considered an unfair practice under the NLRA. Turning on the heat lamps to make one’s entranceway less hospitable to that sort of thing is just fighting fire with fire. Except one tactic threatens the physical well being of a multitude of people, the other is momentarily annoying to someone passing by. Somehow I don’t think they are equivalent. @Neil Hudelson: Well, only if they stay under the lamps for hours on end. They’re free to move on. And I’m not talking about momentary disturbance for those in immediate proximity. The ones in downtown DC are disturbing on the 11th floor two blocks away. And obscenely loud if you’re the poor desk clerk downstairs. And DC police won’t do anything about it, despite it being a clear disturbance of the peace of people having nothing to do with the dispute. 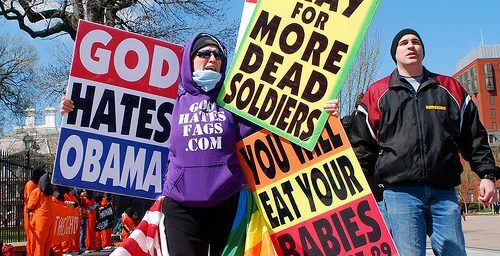 Again, I don’t know whether these folks in Chicago were doing any of that. They may have been silently picketing. In theory, but in actuality is there *anything* which would be treated as such? If you want to improve you’re working conditions, make sure it doesn’t inconvenience anyone else, especially not James Joyner! I guess left-wing utopia somehow has managed not to take root in Chicago, despite liberal Democrats having had total control over its local politics for several decades. Go figure. 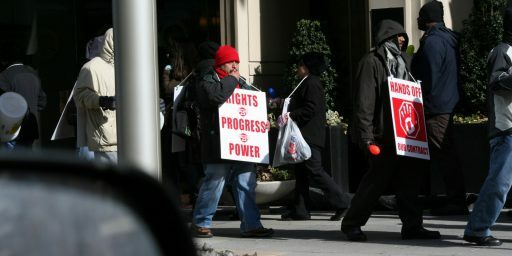 Were the picketers on the Hyatt’s property or on a public thoroughfare? If the later, doesn’t using physical discomfort to make them leave constitute assault? @lunaticllama: I support the right of workers to strike, inflicting economic pain on their employer by withholding services in an attempt to gain leverage and improve working conditions. (With some caveats based on their contracts and CBA.) What I don’t support is the right of people to disturb the peace and interfere with the rights of others not directly involved in the dispute. That’s a negative externality that others shouldn’t have to bear. @Stormy Dragon: I gather that the heat lamps are under the Hyatt awning. Presumably, the have a right to turn on their heat lamps under their awning–or else they don’t have a right to an awning or heat lamps, period. How is there even a union of housekeeping staff? Is there really a shortage of workers who know how to operate a vacuum? @Matt: That’s the nature of unionization. Most of the early unions were formed precisely because individual workers were unskilled and therefore had no individual bargaining power because they were easily replaced. Collectivization gave them much more power because they operated as a unit. I’m actually more surprised when groups like professional athletes, who can command tens of millions of dollars in annual salary if they’re good enough, unionize. There, the individual workers are very hard to replace and it’s very easy to differentiate the truly outstanding from the merely average. @James Joyner: I don’t think you support the rights of workers to strike. Striking always inflicting negative externalities on others. The entire essence is to bring both financial internal and external pressure from others onto employers. I don’t know how else it works. For example, if the NFL strike were to last through September, it would obviously have significant externalities that would affect a lot of people both in direct economic terms (e.g., vendors) and in indirect ways through loss of utility (e.g., fans.) I’m not sure what your conception of a strike is that doesn’t have any external effects. I have no idea about strikes in D.C., because I don’t live there, so I can’t comment on those, so maybe they really were disturbing the peace, although then the answer is appropriate police action. @lunaticllama: I’m not talking about secondary effects of harming a business, although those externalities are real. I’m talking about amplified sounds that reverberate for several city blocks, disturbing those working in offices having nothing to do with the dispute and those living–and perhaps trying to sleep–in apartments nearby. That may well be a DC-specific phenomenon. I’ve never seen it elsewhere, but then I’ve never worked in a major metropolitan downtown area before. DC is a corrupt, one-party town. Police do the bidding of local pols, who are in the pockets of organized labor. @James Joyner: I’m so sorry that these people who are fighting a multinational corporation to preserve a semblence of a living wage for the most powerless among us are disturbing you. Clearly in any civilized country these unwashed mobs would be arrested, or at least herded out of your sight and hearing. Those in the upper classes should never, never be bothered by their inferiors. @James Joyner: Darn those powerful hotel maids, who clearly run your entire city. @WR: This is just nonsense. Is it your contention that any group ought to be able to disrupt the work and life of thousands of people without limits? Or only those with a cause you deem just? Organized labor ought to be able to withhold their services and peacefully and quietly picket. They should not have any more right than anyone else to disturb the peace. Collectivization gave them much more power because they operated as a unit. Very true; What I have noticed also, is that businesses operate on the very same theory. Contrary to public imagination, there are almost no John Galts in the real world of business. Almost every conceivable business is a part of a larger trade organization or lobbying group, whether it is the American Medical Association, National Roofing Contractor’s Association, or whatever. These associations do important work like set industry standards and practices, allowing for streamlined and more efficient methods of trade and operation between individual members. They ALSO operate to lobby and gain favorable treatment in the marketplace, whether special rent-seeking tax laws, or beneficial government contracting and spending, or maybe favorable export subsidies. Bottom line, they do exactly what libertarians like to pretend they don’t- they deliberately distort the marketplace to reduce competition and enrich themselves, much like labor unions. This is what makes the “free market” argument agains unions so false- Hyatt Corporation belongs to a union of hotel owners, distorting the marketplace in its favor- yet when the maids and cooks join together to do the same thing, this is somehow “unfair”. Interesting, about the temp worker protestors. Perhaps it’s simply unavoidable, but that practice seems to me, just from an uninformed vantage and on first blush, to get to the heart of one of the reasons why the labor movement in America today is in such dire circumstances. Presumably, the have a right to turn on their heat lamps under their awning–or else they don’t have a right to an awning or heat lamps, period. Not necessarily. The fact someone is permitted to carry a firearm doesn’t mean they’re permitted to start randomly firing it whenever they feel like. Intent matters. And there’s a big difference between using heatlamps in the middle of winter for the comfort of your guest (which I assume is the normal use) and specifically using them to drive people away from a public space by causing physical discomfort. @Elias Isquith: The Daily Show did a piece on the phenomenon some time back. It’s not just a DC thing, apparently. The notion of professional protesters is bizarre and the fact that they’re temps being paid next to nothing with no benefits by professional labor groups is ironic. @James Joyner: In your formulation, organized labor should not be able to hold a public rally. Does this extend to other groups or is it solely organized labor that does not have the freedom to assembly? Should we bar people from holding political rallies in urban centers because they are loud and neighbors should not be so inconvenienced? Suppose the Hyatt company softball team showed up and began beating the picketers with baseball bats. Would you be standing there going “Presumably, they have a right to swing their bats at things–or else they don’t have a right to bats and playing softball, period”? @lunaticllama: As a general rule, I would not issue assembly permits in downtown areas during the workday or late in the evenings. In DC, most general protests are held on the Mall or similar open air spaces where they can simultaneously get their message out and not cause great disturbance to others. The only difference I see with labor protests is that they are more concentrated. 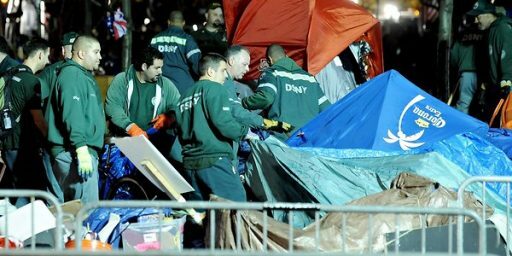 That is, the typical abortion or war protest lasts a few hours and everybody goes home. A typical labor protest, by contrast, lasts days if not weeks. That makes it a less endurable nuisance. @Stormy Dragon: I don’t think turning on a heat lamp constitutes assault. Nor am I sure it’s any more egregious than creating deafening levels of noise for hours on end. @James Joyner: Not sure if those rules would pass Constitutional muster. Generally, not inconveniencing people is not an important government purpose. I think how you framed the organized labor as being unique from other groups is a distinction without a difference. Either you have a right to peacefully assembly in public forums or you don’t. I don’t think frequency enters into the equation. I would say it’s more egregious since causing physical discomfort to people is generally considered more legally objectionable than merely annoying them. And even if it were less objectionable, the last I checked the Hyatt was not tasked with maintaining public order. It’s not their place to go around punishing people for slights against the general public. A typical labor protest, by contrast, lasts days if not weeks. That makes it a less endurable nuisance. It says right in the article that this was a one day picket, not an ongoing thing. @James Joyner: Yeah, they should be able to. But we’ve seen three decades of organized union busting, abetted by the Federal government. Now we’re seeing an agressive push by reactionary Republicans to wipe out all unions once and for all. But by all means, unions should not disturb anyone while they’re fighting for their members’ lives. Because that’s just tacky. @lunaticllama: Generally speaking, time, place, and manner restrictions are permissible. Preserving peace and tranquility is a reasonable, content-neutral public policy goal. @WR: I simply disagree. They don’t have the right to disrupt other people’s lives. They’ve got a right to speak, not a right to disrupt. With a major distinction: trade associations generally have zero power over non-members. The American Hotel & Lodging association cannot force independent hotels to abide by their bylaws. They can’t make independent hotels pay for their union negotiation costs. They can’t ban SEIU members from working at independent hotels. My problem isn’t with labor unions, collective bargaining, etc. I do object to the fact that someone who doesn’t wish to join a union can then be legally blocked from seeking employment unless they agree to the union’s terms. Almost no one walks into a hotel to check in without a reservation. If I have a prepaid room at a Hyatt what am I supposed to do? If there were some way for unions to protest on Expedia or Hotels.com they’d have more effect. @michael reynolds: I’ve wondered that myself. I’ve previously written about a protest against a non-chain hotel a couple blocks from the office that went on for over two months. Insanely loud and obnoxious. Presumably, at some point, visitors knew what they were getting into. But most of the guests were just poor saps from out of town who had their vacation or business meeting ruined. At least guests of the hotel are arguably legitimate collateral damage in the fight between management and labor. People who happen to live in apartments next door or work on that block are innocent victims who have nothing to do with the fight. I do object to the fact that someone who doesn’t wish to join a union can then be legally blocked from seeking employment unless they agree to the union’s terms. Legally blocked from seeking employment anywhere, at any employer? Wow, unions must have much more power than I realized. I am not sure why a union shop is so unfair, when a union and employer mutually agree to have all employees belong to a union. As a practical matter, there isn’t any way to get around the “free rider” problem- can a nonunion free agent work longer hours, or do they remove safety equipment, just for him? It seems much more unfair to demand to work at union wages, protected by union safety equipment, and enjoy union hours and vacation days, while refusing to contribute to the union that makes it all possible. Oh, as for trade associations not having power over non-members; the ENTIRE PURPOSE of political lobbying is to exert power over nonmembers using the coercive power of government. Most laws that are written are actually drafted by lobbying groups, the wording carefully crafted to benefit whatever group is paying the bills. Using your example, the American Hotel & Lodging Association hires lobbyists to draft laws and regulations affecting the hotel and food service industry, forcing even nonmember hotels to obey. It would be amusing to see an independent hotel demand to join the AH&L Association, and participate in its lobbying efforts, while refusing to pay its union association dues. @James Joyner: Perhaps, James, you could write to Hyatt and ask that they settle this labor dispute in a fair and equitable manner. Then those protestors could stop disturbing you. Well, I wonder when the NRLB will be opening an investigation? How is turning on the lamps different than say turning a firehose on the area the protestors occupy. My, albeit limited, knowledge of labor law causes me to believe first the picketers must not be on the employer’s property. Secondly, the employer cannot take hostile actions against peaceful protestors. Unlike Boeing, this is an act directed against unionization. And this isn’t just an Obama supporter here, the Sue Pritzker is Obama’s kingmaker. I never could find the video link but before the 2008 election, Greta van Sustiern had a woman on who laid out the ladies of Chicago who ran Obama, who ordered him to oppose the Iraq war, etc. And the one name I remember is Pritzker. Didn’t mean anything to me then, but now I know. At least the Hyatt strikers were apparently actual Hyatt workers; in DC, they’re temps hired at minimum wage and no benefits. Busy all day, so late to the discussion… Not gonna read 35 comments either but I did want to say that here in the CDC of StL of the Carpenters Union, any striker you see is a genuine Union Carpenter, typically unemployed, and he has a choice of getting $10/ hr (I think) or having the money go to his benefits. It would be nice if it was both but that would be dreaming. Well, it is the law and should be enforced without favoritism. Being a friend of the President shouldn’t get you leave to violate the law. Especially, labor law so near and dear to the Left. Now, if you want to repeal that law, I’m all for it. But in this instance, the law is designed to stop a cycle of violence. Perhaps they want to modify the law to rein in the noise pollution being inflicted on uninvolved parties. Or the Hyatt could just crank up their entrance Musak. James, you should relax and enjoy the show. It is not every day you get to see free men and woman stand up for the rights of working folks. And if it bugs you, then like a previous commentator said, you can write to the hotel owners and demand they negotiate in good faith to settle the labor dispute.